An 'Artissimo' trunk and farewell to my desk. Hello - I hope you are enjoying your day! 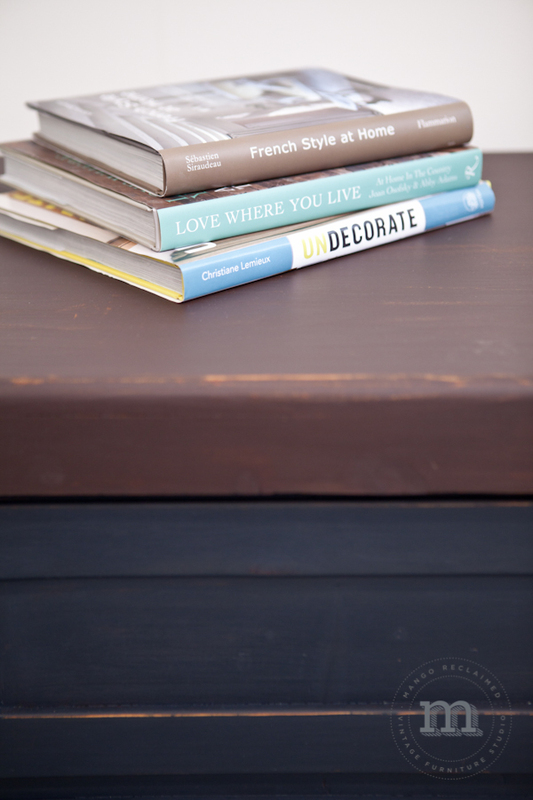 Recently we custom restyled this pine trunk using Miss Mustard Seed's Milk paint. This item was selected by a customer from our online inventory, which is a great place to find furniture that is ready to restyle. Our inventory section showcases items with their dimensions, a price to purchase 'as is' and a price to purchase 'custom restyled'. After collaborating with my customer on colours and looking at some inspiration images that she sent me, we decided to paint out the body of the trunk in 'Artissimo' which is a beautiful, deep, rich blue and then to use 'Curio' which is a beautiful, rich brown for the top. This trunk is going to be used as a coffee table in a downtown apartment. It's the perfect size for putting your feet up to relax and also houses a ton of storage! Here's a glimpse at what this trunk looked like 'before', when it was selected from our online inventory. In other news, I recently sold my desk which has been a huge part of my studio since I opened. . . I really loved this big old bankers desk. It was so sturdy, had a great work surface, excellent storage, and of course custom restyled in Chivalry grey it made a nice statement in my showroom. (We have another one available now in our inventory if you're interested.) But, man - oh man, have I replaced it with something fun! You will have to stop by the studio to see my new 'desk' which has been restyled in beautiful Coral Cosmo and using an oversized stencil of my logo from Muddaritaville! My old bankers desk - restyled in 'Chivalry' has moved on to a new home. If you see something you would like custom restyled in our online inventory, let us know! Alternatively, if you see something you would like to restyle yourself, we can help you do that too! Happy Friday!